FEBRUARY 10, 2016 – Today Capcom, ahead of launching Street Fighter V, announced its Capcom Pro Tour event circuit. CouchWarriors’ eighth annual Battle Arena Melbourne, Australia’s largest competitive fighting game event, and the fourteenth OzHadou Nationals (Sydney), Australia’s longest running competitive fighting game event, will both be Ranking Events on the international esports series, the Capcom Pro Tour, putting Australia’s best fighting game players in the global spotlight. By earning Ranking Points at BAM8, OHN14 and other Capcom Pro Tour Ranking Events, competitors can qualify for a place in the prestigious Capcom Cup Finals at the end of the year. In addition, winners of Street Fighter V at each event will be sent to the Capcom Pro Tour Asia Finals in South Korea; the winner of this CPT Premier event will earn a direct qualification to the Capcom Cup Finals. The Capcom Cup, in its fourth year, has showcased the best of the best in Street Fighter, with past champions including renowned players Naoto Sako, Yusuke Momochi and “Kazunoko” Ryota Inoue. All three have made appearances in Australia before, so only time will tell what sort of international talent the promise of CPT ranking points might bring to Melbourne and Sydney this year, and which local champions will rise up to challenge the best in the world. If you’re looking for your own piece of the action, you can register for Battle Arena Melbourne 8, to be held at CQ Functions in Melbourne on May 13-15, and look forward to news regarding OzHadou Nationals 14 in Sydney, closer to its date of August 26-28. As part of the wider Australian fighting game community, both CouchWarriors and OzHadou strive to make new players welcome, and host a range of events for players to enjoy and level up their game. 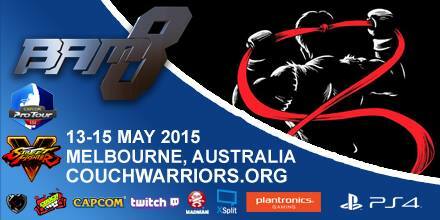 About CouchWarriors: CouchWarriors Inc. is a not for profit association created to energise the fighting game community. Starting in 2006 as an informal community group, it created an event series for social play and ranking battles which serves as the heart of the Melbourne scene. The project has blossomed into large events like the major annual, Battle Arena Melbourne (BAM), providing tournament services, support and resources for industry including major events such as PAX Australia, and ongoing support to community companion events. About OzHadou: OzHadou is a group passionate about bringing together fighting gamers throughout Australia. Since its founding in 2001, OzHadou has been establishing connections between fighting gamers nationwide. As the chief fighting game body in Sydney, the OzHadou team has developed extensive tournament experience which culminates annually in the OzHadou Nationals (OHN), Australia’s first and longest running fighting game major, where the nation’s best gather to compete for the coveted title of “OHN champion”.